Motor Vehicle Accident (MVA) Case? Read descriptions of our deposition outline question checklists and other forms for discovery and trial. 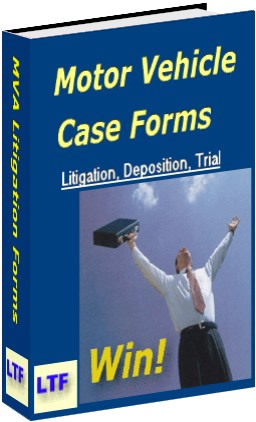 Our legal forms for MVA (“motor vehicle accident”: includes car, truck, auto, motorcycle, train-crossing, highway, pedestrian) include not only deposition and trial questions outline checklists, but also demands for production, requests for admission, eDiscovery litigation hold letters, plus also tips and tactics for investigation, discovery, and trials, and more! “Your forms were great. They were not only a timesaver, but a lifesaver! Thanks again.” Patrick M. Kiernan, a well-experienced trial attorney of St. Louis, who was in a spot where he had only an hour to prepare for a deposition!. This is a pattern deposition question outline for both plaintiff and defense attorneys, and also their legal assistants, in motor vehicle accident cases. This is the basic, must-have, form in any car or truck negligence case- a checklist of the questions to ask in a deposition of the adverse driver, or at trial. new ideas to improve your success ratio. The deposition question outlines in this area of the product catalog are applicable to the depositions and witness preparation of the driver, his/her employer, investigating police officers, passengers, and witnesses in car, auto, truck, and motorcycle accidents.